We have different German Shepherd puppies from different VA lines avail now. We actually have a very prestigious litter right now. Both parents have VA titles. This is not the norm. Our very beautiful Withney also has a VA title with IPO2. She's an amazing girl. These German Shepherd puppies will be great for whatever your heart desires. From show quality to protection or breeding or simply having a great quality pet that will probably protect you regardless of training bc its in their genes on both sides. VA Withney Vom Suentelstein. 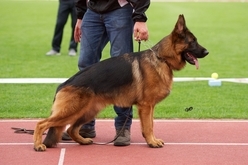 She was bred to VA Schumann Von Tronje. He was also the 2015 US Sieger Show Champ. There are 7 pups in this double VA litter. I do have 1 female and 2 male deposits so far. I do highly recommend a deposit to ensure a pup from this litter. Yuri Vom Osterberger-land. The pups full registration will become available in 2-3 months due to the transfer from Germany to US of the female and the breeding. There is only 1 male German Shepherd puppy left without deposit in this litter. Hurry or he will be gone. Shaggy coat. Highly intelligent. Great pup. page. She's due in about 1 month. I have people asking for Gesa pups. Here you go. 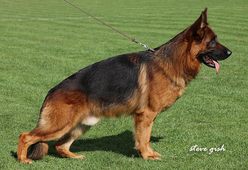 The sire is VA Schumann Von Tronje as well. He was Va in Germany and US as well. enough food to help you transition to their new food with less stomach issues. separate a puppy CLICK HERE: . Please specify mom and color of the collar. Thanks. Well you have now seen all our German Shepherd puppies currently available. contact me at 305-775-6538 or you can email me at zeyrac@aol.com. in my most prized possessions, my German Shepherds. All our puppies are DM free. All Parents have been tested with neg results. of mind regarding the health of your puppy. If you like the pedigrees Imagine how the puppies will turn out. Apart from their genes the way we bring them up makes all the world of difference. From full family life, swimming therapy, socialization from babies to small dogs. We have the best available program to ensure that your new puppy has been through a normal family environment since birth. Place your deposit HERE!!!! Please specify mom. Please email or call before placing the deposit to ensure the puppy is still avail. You won't be disappointed with the quality, beauty and temperaments of your new family member.When placing a deposit you have decided that this is the kennel you want a puppy from. If for any reason you cannot get the puppy that you placed a deposit from you can transfer the deposit to another litter or dog. The deposits are non refundable but definitely tranferable. Many people ask me why I speak so much about pedigrees. 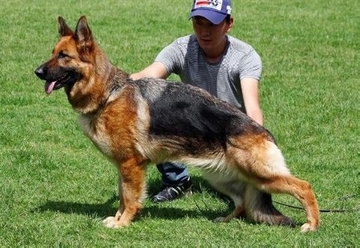 When families are deciding on purchasing a german shepherd they want to make the best decision they can. Its not a car purchase or a new TV. Its a lifelong family member. The better the pedigree, of course, the better the dog. 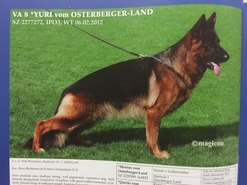 Thats why we strive for only the best pedigrees in Germany. When we have a litter we know that they will have all the opportunities available because of their great pedigrees. The better the dog turns out, the more the family will love them. 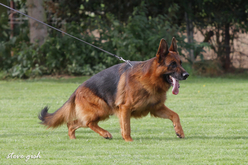 If you get a low pedigree dog you can expect to have difficulties in some aspect of their life. Whether it be with discipline, commands, structure, health issues, ect.. When you purchase a great pedigree, Yes, it will cost you a little more at the beginning BUT you are purchasing peace of mind as well. There is little chance that you will have the problems I mentioned before because the dog comes from great families and show histories. That's why I show my dog's pedigrees with pride so you can make a well educated decision. All my dogs also have their DNA registered with the AKC so the puppies can be verified. I hope this answers the question. Also since I am a family breeder the better the pedigrees the easier it is for me to have all my adults and puppies roaming my house because I know how their temperaments will turn out. All our German Shepherd puppies for sale come with: AKC open registration, 3 generation litter certificate, curr vaccines, dewormings, microchipped, health certified, puppy pack with helpful info, collar & leash , food for 1 week & a toy the litter uses to help adjusting. Most important lifelong support. Our imported puppies come with German Passport, Current vaccines, Microchipped in Germany. Health certified by a vet, Puppy pack with helpful info, Collar & leash. The pink papers arrive in about 5 months, then can be transferred to AKC for a fee that they charge. 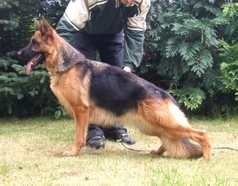 Our pregnant females from Germany take about the same time to register the litter with AKC. 5-6 months typically. Please be patient, it is a long and tedious process but definitely worth the wait. No one breed of dog is for everyone, but there is one breed that could be for just about anyone. It's known for its beauty and its brains; its strength and its gentleness. It's a helper to the disabled, a guardian of homes, a companion to children, a protector of livestock, and a partner in crime-fighting. There is little this dog cannot do, and almost nothing it's not willing to try. It's the multi-purpose, multi-tasking, ever-popular, hard-working German Shepherd Dog. 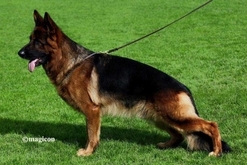 Our German Shepherds for sale are a perfect addition to any family. *** Most of the dogs sold for less money are usually from people cutting corners, puppy mills , inbreeding family , upbringing the puppy with the wrong feeding program, care and socialization;buying lower quality pedigrees that will produce low quality and poor temperament dogs. are raised in a family environment, not the usual kennel life. All our German Shepherd puppies for sale come with hips warranty.